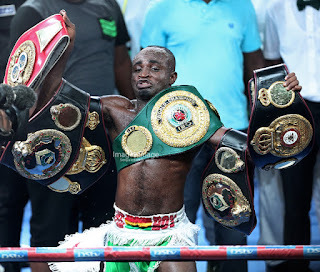 Popular Ghanaian boxer, Emmanuel Tagoe, has discovered that he is not the biological father of his fourteen-year-old son. According to Yen Ghana, Ghanaian boxer decided to do a DNA test, when he suspected his baby mama and her family of conspiring to blackmail him. He revealed that the boy’s mother always made ‘abnormal’ demands of him, including forcing him to take the boy to the school, even when she knew he could not afford the fees. The boxer, Tagoe revealed further that he was paying GH₵ 500 every month for the upkeep of the boy, but mother keeps demanding more money. It was at this point that he decided to go in for the DNA test which proved that the boy was not his biological son. Ghanaian boxer also blamed his mother for the situation he found himself in. According to him, it was his mother who forced him into accepting responsibility for the child even though he kept on insisting that he had not impregnated his baby mama. A Ghana sports journalist, Saddick Adams, who broke the news on his Facebook page, revealed that the local boxer is shattered and broken after learning that the boy he had raised and cared for over the past fourteen years is not his son.